It was love at first sight for Mr I and the Palm Tree~~Who could say "No" to the idea of an artificial, Christmas lights trimmed palm tree? I certainly couldn't veto it! He was so excited when he called me from the Curious Heart shop. That's where he finds the most outrageously funny gifts ~~ Mr I is a man who's not really attached to things...so, I knew he must really like this Palm Tree. He was so right, it's a perfect tree for us! Since that fateful day about a half a dozen years ago, we have had a wonderful time theme-ing up the tree. It's a tropical celebration in a four seasoned part of the world! in bee hives, seed packages, small flower pots and Rose doesn't the bird house look great on the tree! the cutest straw bird nest. ~~It's all dressed up for The Girl Friend's Get Together (GFGT). The get together is always themed and I get to choose the theme. The GFGT started a few years ago.... as a way to simplify holiday scheduling with half a dozen people. It has grown into a very fun evening. I prepare the entree and everyone else brings the side dishes. It always works out just right. No matter what the entree, the sides are perfect! Of course, there is dessert. Chocolate~~ and this year there is plenty of it. Last year's theme was comfort. (go here to read about it). 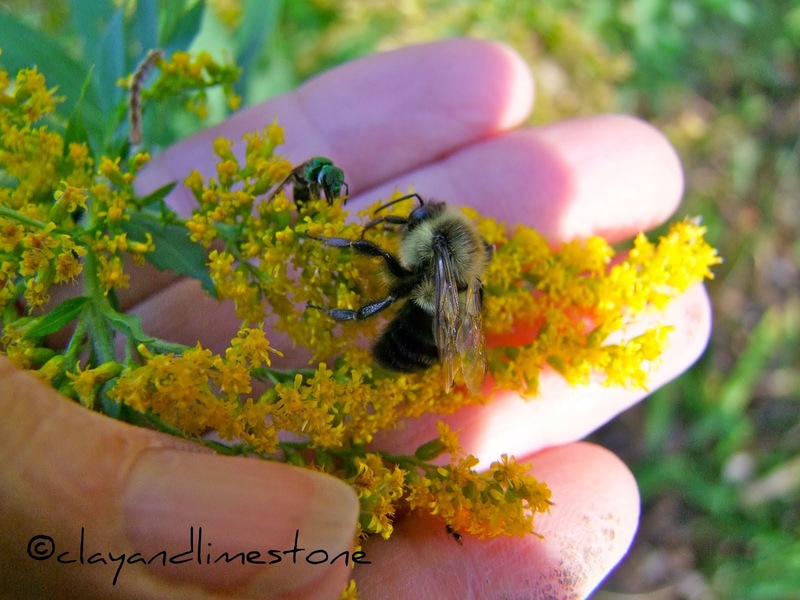 This year's theme is one that is near and dear to many a gardeners' heart~~Pollinators. Those glorious creatures without which gardening and agriculture would cease to exist! So party favors, Christmas gifts, decorations are pollinator oriented! What do you think of everyone's gift this year~~Leaf Cutter Bee houses for all~~Leaf Cutter Bees are important pollinators for veggies and flowers~~The table is set with the funny little critter lapel pins and the cutest little scrolls from India. The scrolls were a really great find! Rolled up in each one is an envelope that's supposed to be filled with dollar bills. No money, instead they are filled with Rudbeckia hirta seeds! Susans for everyone! A perfect Clay and Limestone Merry Christmas to the dearest friends ever. I so wish you could be here, too! I am not a big fan of artificial trees, but if you are going to have one it should be obvious, and I love the palm tree. Please have a good time at your party, have a merry Christmas and a happy new year! What a delightful theme and table. I know everyone had a great time. I think your gift was perfect to go with the theme. I sure wish I had been there too. I can just feel the love oozing off this page. Cheers. Gail -- oh, what fun! I love your theme and the sense of humor around decorating! PS The musician was kind enough to buy a fresh green wreath for the front door. I ran out onto the porch and stuck a bow on it! LOL That's the best this sick person can do this year. What a fun tradition Gail. All your pollinator things are very interesting and colorful. How wonderful to have a great group of friends to share such a great evening together. Gail, the birdhouse looks perfect on this tree, especially with the bright red bird making it a home. Sounds like a wonderful party--bee-lightful! I'm looking forward to two get-togethers next week, one with high school girlfriends I haven't seen in years. The quote by Goethe is perfect for describing the importance of friends. Wishing you a very Merry Christmas! Thank you, too, for the lovely e-card--we really enjoyed it! Goethe certainly had a way with words, and I think he must have been a gardener as well. I absolutely adore your kitchy little tree, and I love the theme. What fun it must have been at that table soaking up all the conversation. Your table settings looked so pretty and festive too. What a great way to chase away the dark and dreary weather that often clings to the winter solstice. The days are going to get longer now--that much closer to spring and a new garden! What a great tradition! The scrolls are really cool, and I'm sure everyone will have fun. Merry Christmas!! What a fun idea to try new trees and decorations:) I love the leaf cutter bee houses. I think masonry bees use the same house--maybe. I enjoy the swiss cheese leaf designs the cutter bees make on some of my rose leaves. Your party sounds like a wonderful tradition. Wishing you and yours a Happy Christmas and New Years. Such fun! Love the tree and pollinator part favors!! Happy blessings of the season! Gail, Every post that you do is remarkable. This one is just as gorgeous, and I LOVE that table setting. What a wonderful idea, you must have worked so hard to find everything. A palm tree, now why didn't I think of that? I love it. And I especially am smitten with the Bee Hives. Love them. Sounds and looks delightfully festive, Gail. With all done to perfection, enjoy the party! (Love the favors) Happy Winter Solstice and a very Merry Christmas! what fun you are having at christmas time. i love it all. we should celebrate with what is most important to us. i love the scrolls filled with susan seeds. great idea. of course everyone was sure to love the leaf cutter bee houses. that palm tree for christmas looks and sounds like a lot of fun...of course the theme this year is delightful. you certainly are enjoying christmas. This sounds like a wonderful time!!! I just love your tree! I have a small pink flamingo in my tree every year since way back! What a creative idea to celebrate pollinators...Many people do not give a second thought to them. I love your leaf-cutter bee house. I used to celebrate finding their little nests inside of little knot holes. Here they love our rose leaves as well as Bougainvillea leaves. **We have lots of palm trees in our area, but I have never seen an artificial one...I love it! A definitely unique tree Gail :) Your party sounded great fun too. Wishing you peace and happiness at Christmas and in the new year too ! I love it all! It looks like a wonderful event, I wish I could join you. 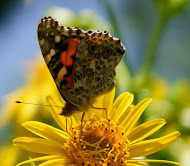 Have a great time celebrating pollinators. Gail, that's a delightful and entertaining alternative to the usual tree dilemma! I love the GFGT idea and this year's theme is BEEyooteeful! Love it! I think anything goes at Christmas! H.
Kathleen, I sure wish you lived nearby! No, my gf are not gardeners...I stil love them! What fun! You are many things I am not - More power to you!! That is a very unique tree. I love the table settings! Your table is sooo beautiful. I'm still stuck in a yearly discussion about whether to stick the jam jars on the table or scoop it out into a pretty bowl that we'll have to wash later! Have a great holiday. I love the tree and your theme. Your party sounds like so much fun. Hope you all have a great time! What a great tradition! Love your theme. Well what a novel idea. Have a lovely Christmas. Hey Gail, Merry Christmas to you and your family. Your tree is adorable. Love how you decorated it. Love the idea of the girls get together. I love how you decorated for it. Enjoy the holidays. Hope all goes well with your surgery in Jan. Your theme is wonderful. I love the bee house. I've thought about getting one myself. The little fellow in the anemone in the last pic is so adorable. I love your tree decorations and party theme! I loved your party theme from last year too. I am not one who has the attention span to carry off themes much, either, but love what you did with your unique "palm" Christmas tree. Your party theme sounds fun, and I love what you did with the pollinator theme. Oh goodness Gail, your table is stunning. Those bee pins on the favors are very attractive. You've outdone yourself this year. Just gorgeous. Your table is beautiful Gail, set with love and thoughtfulness. I'm sure everyone had a wonderful time. Believe it or not, I always miss my native Florida during Christmas. I guess tropical holiday is in my blood, so this tree is something I feel I need ASAP! Decorated with glittered flamingos of course. Your GFGT tablescape is gorgeous - lucky girlfriends. Have a great holiday, Gail!